Do you know what it takes to get insane results in your business? Momentum. All of you business owners out there, I’m here today to help you build the momentum you need that is going to literally explode your business to levels you never thought possible. What I’m digging into on the second episode of this series is a list of six action items you can take consistently to reap the rewards of the business you dream of. Join me to get started on your road to building a six-figure business, or multiple six-figure business! Figuring out the action steps that work for you and your business doesn’t have to be confusing because I’m spelling it all out for you here today. What will help you produce the results you want. How you should treat your business if you want massive growth. The action items you should be focusing on to get to six figures. What active action items and passive action items are. 6 things you need to be doing as your daily success behaviors. Hey guys, it is episode number two of Next Level Your Biz series on my Soul CEO Podcast. I am so excited you are here. I am definitely showing up at the next level too on these episodes. I am bringing some sassiness, I am bringing a little bit of tough love for you guys, and I am really committed to helping you next level your business in the next five days. So don’t forget if you want to take this work even deeper, if you really want to go all in, make sure you go to lindseymangocoaching.com/ws, where you will get an email with the podcast episodes when they go live and a worksheet. The worksheet is gold. You guys, like, I poured everything into these and I want you to get everything out of the next five days. Because here’s the thing; if you cannot commit to showing up for five days for your business and going all in, we need to look at why. That’s a huge part of this. So I’m not going to get too far into that because I’m super excited to jump into today’s topic, called Daily Success Behaviors. So, something that I find when it comes to business owners is they get confused on what they need to be taking action on and or they get safe and take action on things that are a lot safer and don’t actually create clients and then that creates the cycle of frustration and the cycle of they’re not getting results, and so it kind of creates this spin out. And so I’ve created this process of developing a list of your very own personal daily success behaviors because here’s the thing; you guys know I am all about mindset, but if you think about it, a business owner who’s running a six-figure business and over six-figure business is focused on the actions that they’re taking every day. So the reality is coming from that mindset of like, I already have the result that I want, I’m already a six-figure business owner before you even are is what’s going to help you produce those results. And yes, your actions create the results that you guys get. So I’m really excited to help you guys develop your very own action item list, and the worksheet is going to take you through it even deeper so you end up having like, six things you need to be doing every single day. And don’t worry. You guys know I’m all about helping you grow your business but these action items are also for you as a human being because you are your greatest asset in business. If you don’t feel good, if you’re not showing up at the level you need to for your own life, then your business will suffer. So it’s not just action items in your business, it’s also action items for you. So before we jump into that, the one thing I want to address is this idea of treating your business like a six-figure business or like a multiple six-figure business, depending on where you’re trying to go. Something that I find happens a lot with business owners is they talk about their business like it’s a side gig or a side hustle, or it’s this little thing that they’re doing on the side. Or they’ll even make statements about how my business isn’t paying the bills, or they talk about it like that. That’s where I started. I started as a life coach. Now I’m a life and business coach, but that change, and I was like, “Oh yeah, I have this job but I’m leaving that as my business grows.” There’s a difference. That comes from knowing like, hey, I’m a life coach, this is what I do, instead of saying it’s this side thing. So before we even get to the daily success behaviors, I want to ask you guys, are you treating your business like a six-figure business? Are you treating your business like a multiple six-figure business? And when I say that, I don’t necessarily mean the amount of time you’re spending on it, but I do mean the energy, I do mean the intensity. I do mean where is your business falling on your priority list. Because it’s okay if your business isn’t one or two or three on your priority list, but let’s get real on how quick it’s going to grow, because does the six-figure business owner, does the multiple six-figure business owner, does she let her business fall at number six or seven or eight on the priority list? And totally, it’s okay if your business is that far down, but just know that the results and the momentum that you build will reflect in that. So if you’re okay with your business growing a little bit slower, if you’re okay with doing it that way, totally fine. But if you want massive exponential growth, which is why I think you guys are all here, it’s really important that you are treating your business like the business it is. And if you’re doing anything less than that, then you will basically speak your results into existence of your business not turning into the business that you want. So get really clear on that, and what does that look like to actually treat your business like a six-figure business? What would that look like and how can you scale that down to your current reality? I know some of you guys – I worked a corporate job while I built my business, but my business still fell very high on my priority list and I allocated energy and time to it that way. I absolutely spent more time at my job than I could on my business, but my business was a priority. When I woke up, I made sure I got my content created. When I came home, I made sure I followed up with people that messaged me. On Saturdays I would get up and do some of the work, and I know some of you guys have kids and you have more on your table, but make sure that you are prioritizing and allocating your energy and the intensity that you show up in accordingly. So from there, I’m going to help you guys build your daily success behaviors. So, something that I find happening with a lot of business owners early on is they focus a lot of their attention on things that honestly don’t really matter that much. And I’m not saying that to just trigger you guys or make you upset, but I think the reality is especially when you’re getting your business to six figures, your job is to get clients. Create clients. Yes, I talked about this on the last one and it may sound a little contradictory. I want you to do what you love in your business, but hopefully what you love in your business, if you’re following kind of this process, is the thing that you’re offering, is the thing that you’re creating. And so your number one job as you build your business to six figures especially, is to focus on action items that are going to generate clients. So here’s the thing; my story isn’t going to be your story. I totally get that. But I’m just using this as an example. I built my business through replace my corporate salary before I ever even had a website for six months. I just told people to message me, I messaged people, I talked to them, I hopped on the phone and did consults. The website wasn’t really that important because I, for me personally, use social media to get my word out there. The action items I took were all about how can I get in front of people, how can I get clients. Knowing that like, I didn’t necessarily need a website to do that. So make sure that when you guys are doing this work on your daily success behaviors and creating your list, make sure that your action items are lining up accordingly based on where you are in business. So like I said, if you’re before six figures, really important to stay focused on the action items that are going to create actual clients. I actually call this active action items because these are actively creating clients. Now, there’s passive action items and these would be things like a podcast. This is a great example actually. Or maybe even writing a blog. And if you love to do that, that’s perfect by all means, but make sure that you’re prioritizing your action items as well. A podcast is something that takes time to develop and takes time to build and create lots of value. It takes an investment on my part. It can take all of these pieces. So early on it’s really important to focus on the things that are going to create clients and get you in front of people and I’m not saying that there’s only one right way. You guys know I’m huge on that. You get to create your way, but make sure the actions you’re taking aren’t coming from a place of I need these things in order to be confident to get clients, or I need these things in order to look legitimate to have clients, or any of those things. If your action to create a website or do any of the things that you’re doing in your business are to create confidence or certainty or whatever it is, then you’re not doing your work because your mind is what creates the confidence. I’ve seen people have amazing websites, business cards, all of the things, and they still have no clients. I want you guys to have clients and then create those things, or if you create those things, it’s a byproduct of already knowing clients are on your way and you’re just super excited. Perfect, amazing. So make sure before six figures, you’re really taking lots of active action and that’s where your focus is. It doesn’t mean passive action isn’t important. And past six figures, you’re focusing on a combination of the two. I spend a lot more time in “passive action” meaning I’m trying to add value to tons of people. I’m not having one-on-one conversations with a lot of people, and we’re going to get into this in more detail. So just so you guys know, active action items, I made this up, are things that directly create clients. Passive action items are things that you create around your business that help you get clients but don’t actually get you clients. So that’s kind of the difference. It’s working in your business, which is active action, versus on your business, which is passive action. So now we’re going to get into daily success behaviors. So we’re going to create a to-do list of six things you need to be doing, and this is where, again, if your business is not number one – obviously I hope you are number one on your priority list, which is actually the first thing we address in your daily success behaviors. But I want you to know that we’re creating a list for the action taker, we’re creating a list for the people who are ready to blow their businesses the hell up and are just really showing up and building momentum, but this is still going to be valuable if your business isn’t quite at that level yet or you’re not approaching it that way and you know your results reflect that. So the first thing that’s most important when it comes to daily success behaviors is you. And I know some of you guys, you might have mind drama about this, I would look at it. But I will tell you, if you don’t give to yourself at all, your business isn’t even the only thing suffering there. Your family is, your kids are, your husband or significant other is, your job is. Whatever it is that you’re doing. And I’m not saying to do a billion self-care things every day. I am saying the number one thing on your daily success behaviors list needs to be you and you need to pick one activity every day for yourself. So put it in that line. You can write one, and again, the worksheet will help guide you to create – will actually have spaces so you can put these things in. But the first action item, the first daily success behavior needs to be something for you. That could look like 10 minutes of something, of meditating. It doesn’t have to be hours and hours and hours. I want to be clear on that, and I want you guys to know that your action items need to fit in with your current life. Coming from a place of this is what I would be doing at the next level but also connecting it back to and this is what I’m doing now to get there. These are the actions I’m taking now, I just can’t take 10 hours of them. So first thing, do something for you. You are your greatest asset in your business. So for me, just to give you guys some examples, that looks like working out. I work out probably four days a week consistently, four to five days a week. And if I don’t, I try to move my body and because I have my business in a place where I’m scaling, I also for myself, I journal and read every morning. So that’s another piece. So those are the things I do for myself, but just pick one thing. And the thing about this daily success behaviors list is understanding that it could change. So maybe the first one is you work out or maybe tomorrow you’re like, okay for me, what I’m going to do is I’m going to go on a walk with my dog, I’m going to go play with my dog, or something like that. So number one is what’s the action item you’re going to take for yourself to fill your cup up first. Number two, your life and your business will grow as much as you do. So number two daily success behavior is what are you doing for your growth. How are you growing? That might look like a podcast, it might look like a podcast on your way to work. It might look like reading a book while you’re on the stair-stepper. Maybe you’re killing two birds with one stone. I am all about that, as long as your energy is focused and you’re really being intentional about it. How are you growing? Are you listening to this podcast? Your growth is so important. It doesn’t matter what you do, whether you’re a coach, whether you are a network marketer, whether you are in fitness, whether you own a real estate business, photographer. It does not matter what you do. If you don’t invest time, energy, whatever, in your growth, your business will reflect it because you have to grow. Your mind has to grow. You have to invest time in yourself to grow to new levels. So remember that. Your business and life will only grow to the extent that you do. So the number two daily success behavior is growth. Personal development, something like that. Now, this is so cool. We are on number two of your to-do list and we haven’t even talked about business yet, and there’s a very specific reason why I do this. Like I said, you are your greatest asset in your business. I am not here to just get you business results. I am here to get you business and life results, and I truly believe that when you give yourself what you need, your business will grow exponentially. Alright, now we are getting on to number three. Number three is also very important. These all are very important. This is why I created this list. This is why you guys are going to get that worksheet. So number three is doing something to improve your expertise in whatever your business is. Doing something to improve your expertise. So, for me as a coach, I do a thought download every day. I write down what are the things on my mind, and I actively work through them because I know what I work on in my mindset and in my life and in my business is going to help me elevate my expertise. But also, I show up to a mastermind and I read books and I take programs and courses and I do all these things. So I make sure that I allocate at least a little time every day to growing my expertise. So whatever your expertise is, allocate, again, all of these things, these could be 10 minutes. We might just be like, 20 minutes or 30 minutes into your daily to-dos so far, depending on what you do. So how can you grow your expertise? Because as you grow your expertise and you really see the transformation that you’re making and the growth you’re making, it also is going to help you build that confidence. For me as a coach, when I get transformations and I understand what’s going on behind the scenes in my mind and the things I’m applying, I become a better coach. So how can you grow your expertise, number three. Alright, number four, five, and six, are all getting into the business action items. These are into the active action items. Like I said, if you’re really scaling to six figures. So the first two are going to be things that put you out in front of people. So I talked about this on a podcast before, but what’s really important is that you add value to your audience or potential clients. We’re going to talk about this in selling without selling. That’s another episode on this series. It’s going to make your life so much easier. But it’s really important that these first two action items for this daily success behaviors list is an action that gets you out in front of your people. Here’s the thing; this is why I’m touching on this because this so many people get stuck in this. It doesn’t matter how good your website is or your blog is if it’s not in front of people. Period. If you don’t have – it doesn’t matter how good your event is if you don’t have people or you’re not in front of people. So these next two action items, I want you to think, what is going to get me connected with people and adding value to people? So I’ll give you guys an example of what this looked like for me. I built my business on social media, so that meant every day, one of my daily success behaviors was I posted on social media. And it’s really important to be consistent in whatever you guys are doing. You don’t get the momentum of the actions you take if you’re not consistent. So I would post on social media every day. The other one I would do is I would build relationships. So I would go get coffee with people. I went to networking events. I would message people who I was intrigued by. Be a human, be real. Don’t be like, “Hey, I’ve got this business opportunity.” Be somebody that you would want to talk to. So those two items are really about getting in front of people, adding value, and making sure that you’re connecting with people who are potential clients. Again, like I said, that’s what’s most important. Even if you have one thing to offer your audience, that’s perfect. That’s fine. Go get in front of more people. Go add value to more people. So again, like I said, I connected with probably two to three people every day on social media or in real life, and I posted on social media every day. Now, if maybe you’re not building your business on social media, totally cool. Maybe that item is calling and connecting with people or meeting people with coffee. Maybe you do double whammy and you go – both of those daily success behaviors are about I’m going to meet five people every week, or I’m going to go meet two people every day. Then the last action item is kind of like a soul-filling action item to create results, is what’s an action – and all of these actions I hope are things you would be taking if you were a six-figure business owner already. But what thing do you truly feel called to take action on if you were already at six figures? What thing would you be creating if you were already at six figures? What action would you be taking? So maybe that does look like a podcast, maybe that does look like doing consistent Lives every day or building a community or doing something like that. 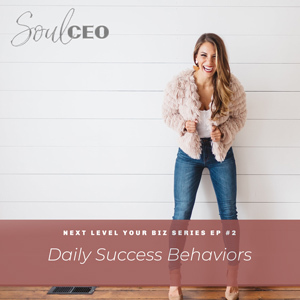 But the most important thing that I want to be clear for you guys to build your business is how important the first three pieces of these daily success behaviors are as well as getting in front of people and adding value to people, especially early on. I mean, at my level, my biggest thing is to add value to massive amounts of people, and so I don’t get one-on-one interaction as much as I used to because I’m recording this. So I can speak to 5000 people. So I’m super excited for you guys to dig into this, and then I want you to focus on doing these six things every day. And here’s what I want you guys to know is that your life and business will change gradually and then suddenly. I forget who said that quote. But like, it happens gradually and then suddenly. So over time, you’re building momentum. So the first week, first of all, you’ll probably feel amazing because you’re taking all this action. But also, you are building momentum. And your job is to build and build and build and build all of this momentum and stay consistent and show up and do these action items over and over and over again, and that’s how you get results. I kind of think about it like fitness, right? You can work out for five days and be like, wait a minute, I didn’t get these massive results, I feel a little bit better, should I keep going? But what pays off is working out for an entire year, then the momentum builds from an entire year of showing up and then you look in the mirror and you have this body that you always wanted or this health that you always wanted. So enjoy the process while you’re doing these daily success behaviors. Go back to number one. Go back to number one of this series where I talk about connecting to your heart, making sure you’re doing that over and over and over again, and then make sure you’re taking these action items, having fun with them, and connecting with them and doing them and enjoying them, and that’s your job to create that. I really want you guys to commit to doing these actions every day and say like, I’m willing to do this until the end of time, and try different things and learn and grow and take more action. That’s what’s going to get you guys insane results. That’s what’s going to build momentum that will explode your business and eventually, you’ll reap the rewards. So now, for all of you guys in business, I want you to know you know exactly what you need to be doing. So if you ever feel stuck in that, just know your brain is trying to get stuck in confusion and that’s not true, and you can go back to this work and you can go back to that worksheet. So again, if you guys want the worksheet, make sure to go to lindseymangocoaching.com/ws and you will get an email with the worksheet attachment. And so I’m super excited to jump in the rest of the content this week. You guys can probably hear me breathing, Pavel is probably going to be like – my producer is going to be like, what the hell is going on in that closet, because I’m just so intensely and passionately talking to you guys because I just know that this can massively change your life. And this is what I do with my clients. This is the level of coaching times 10 I’m going to be bringing to my next level mastermind ladies. We are going to blow the lids off of their business and it’s going to be insane. So anyway, I’m just excited to be here and I cannot wait for the next three days of this series, and I will talk to you guys tomorrow. See you.